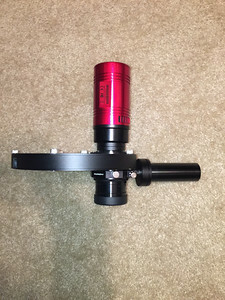 I my quest to understand and implement off axis guiding on my Celestron EdgeHD 11, here is my second attempt using a different hardware configuration. The first effort was done with a standard DSLR camera. 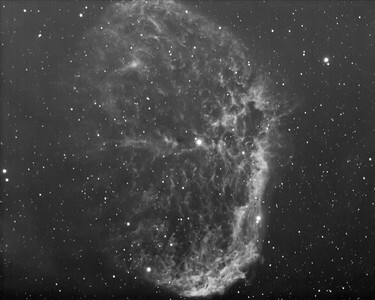 This effort was done using a filter wheel and CCD camera. It required some additional adjustments, and different spacers in the optical train, due to back focus differences. What was nice, is that it took less time to setup compared to my previous effort. Capturing setup included a Celestron 0.7x focal reducer, Orion TOAG using a LodeStar X2 guide camera, Starlight Xpress Filter Wheel and Atik 460ex actively cooled CCD Camera. 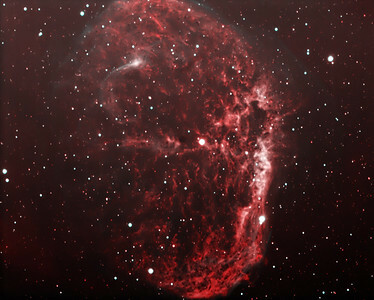 This a narrowband image of the Crescent Nebula NGC 6888, using a Astrodon 3nm Ha and 3nm OIII filter. Captured 15x600sec H-Alpha, and 10x600sec OIII Lights. No Darks, Flats or Bias frames applied. At a focal length of ~1960mm f//7, it filled the entire frame and was a challenge to center properly. I would have liked to capture more data, but I ran out of sky because of the high trees around me where I live. As this is work in progress, I will be collecting additional data and adding to this effort. Post processing was done with PixInsight and Photoshop CS6. 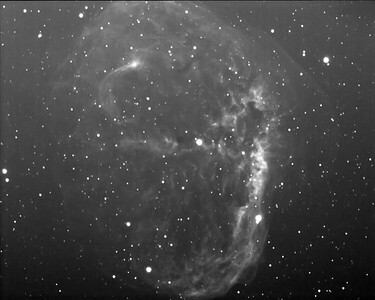 I used the H-O-O narrowband palette to combine Ha and OIII. I've include the raw Ha and OIII. Includes an Atik 460ex CCD mono camera, Starlight Xpress Filter wheel, and Orion TOAG.